ERP vs. CRM: What’s the Difference? CRM software helps businesses manage relationships with customers and prospects. Enterprise Resource Planning (ERP) software aggregates data so that businesses can manage and plan resources like staffing and materials. CRMs are used for sales and can be inexpensive with free options available, while ERPs are more robust and therefore more costly. Because ERPs are robust and can cost a lot, most small businesses need a CRM over an ERP. Freshsales is a solid CRM choice because it offers customizable CRM features and because its parent company, Freshworks, also offers a full suite of ERP-like business management tools. Sign up for a Freshsales free trial to try out them out today. An ERP system works by developing a central network that connects internal departments and external stakeholders with function-specific modules that feed into a central hub or database. CRM software focuses on building relationships and helping salespeople move customers and prospects through a sales pipeline. However, CRM software can also be a module within a larger ERP systems. ERP systems are made up of various modules that represent core business departments and functions, allowing different teams to interact with each other and work from a centralized software. For example, financial, human resources (HR), procurement, and more can all use the same ERP system. Business owners and other users across the company can access shared data and gain insights that make them more productive and the business more profitable. Core modules and features included in most ERP systems specifically support finance, accounting, HR, order and project management, manufacturing, analytics, and even sales. Because every business is different, ERP modules will vary by business type. These ERP components are important because they give business owners and managers easier access to information needed to improve their businesses without having to access multiple systems. Financial Management and Accounting – Features that let you perform a variety of financial tasks in areas such as accounts payable, accounts receivable, cash management, budgeting, and general ledger. Order Management – Functionality that allows you to manage orders and inventory. Human Resources – Modules that allow you to perform tasks in, and get data from, HR functions and activities like recruiting, benefits, time sheets, payroll, and training. Manufacturing – Features that enable you to manage manufacturing activities and resources, including work orders, bill of materials, and product life cycles. Reporting and Analytics – ERP systems offer one place to access and create reports that touch every functional area within the business, giving business managers access to key insights about the company’s health and profitability. CRM software works by creating an ecosystem that links salespeople with selling activities and sales data. It allows users to input, store, and manage information about leads and customers that will help sales teams move customers and prospects along the sales cycle at a faster pace. CRMs have pipeline stages that mirror this sales cycle and can be set up to do any number of things, such as alert you to follow up with a prospect or even send an automated email. Every CRM system should include features like contact management, opportunity management, and lead and prospect management functionality. These features are important because they help you stay organized and give you easy access to the information you need to move opportunities along the sales cycle. However, some systems may also include more robust functionality as well. Lead and Prospect Management – Functionality that allows you to manage leads and prospects in one place, convert leads into pipeline contacts and customers, and manage lead and prospect communications. Account and Contact Management – The ability to access information about your leads and customers such as contact details, interactions with your company, pain points, and even personal details like coffee preferences. You can find the products that do this the best in our article on the Best Contact Management Software. Opportunity Management – Features that let you manage your pipeline by tracking things like opportunity stage, probability-to-close, and opportunity-to-close ratios. Each of these broad features, as well as more targeted features discussed later in this article, allow you to define and carry out activities important in getting deals closed as it relates to your sales cycle and the associated CRM pipeline. For more information on organizing your sales cycle into stages, read our article, 8 Sales Pipeline Stages every sales team should have. ERP systems generally cost more than CRM systems. The reason for this is ERP systems are usually very customized and require a lot of technical expertise to plan, design, integrate, and implement. Labor, software, and hardware can cost millions of dollars. However, there are a few small business-focused, cloud-based ERP products like Microsoft Dynamics 365 and TradeGecko that cost $79 per month to $799 per month, without the heavy development expense. Standalone CRM software costs can range from free to tens of thousands of dollars per year, depending on factors such as the number of users, types of features, customization capability, and whether or not the software is cloud-based or hosted onsite. Unlike ERP costs, CRM costs are more budget-friendly, with small businesses often being able to find feature-rich, non-enterprise level CRMs for prices ranging from $20 to $80 per month per user. ERPs are right for large companies growing at a face pace and have teams and departments using different systems. CRMs are right for salespeople or teams that rely on relationships and engagement in order to close deals. Most companies start off using a CRM because the focus is on sales and customer acquisition. Once they’ve achieved a certain level of growth, they add ERP functionality. ERPs are great for high-growth businesses with widely distributed departments and/or network of partners. Companies with aggressive acquisition strategies are also great candidates for ERPs. Businesses in most industries can benefit, but the businesses that tend to use ERPs the most include manufacturers, product-oriented businesses, construction companies, and project-and service-oriented companies. 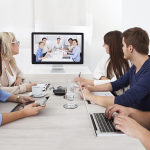 Business with widely distributed departments – Companies with widely distributed teams are great candidates for ERPs, especially if they use different software. The ERP can serve as a central repository to access data no matter where you are and what system you operate in. Aggressive growth and acquisition companies – Businesses growing quickly and acquiring companies can benefit from an ERP because ERPs can scale as companies grow. It’s great for acquisitions because it can serve as a common platform if the companies were using different systems. Companies using multiple software systems – For companies using different systems for each core function, ERPs are great because they serve as a single location where teams across the company can access data. Manufacturers – ERPs are great for manufacturers because most ERPs have manufacturing modules that allow you to track and house data such as supplier information, bill of materials information, and product life cycle data. Project- and service-oriented companies – ERP systems have project management modules as well as modules that track service requests and work orders. The nature and types of businesses above can all benefit from ERPs because either their growth or structure make accessing data or performing key functional tasks difficult. If designed and implemented properly, an ERP system will simplify functional area tasks and make accessing data easier, even in a complex business ecosystem. CRM software is right for industries of any size that sell products with longer sales cycles or those that take part in relationship-based selling. A few of these industries include real estate, technology integrators, construction or general contractors, automobile, and corporate caterers. CRMs help connects salespeople to prospects, organize information, and help and manage post-sales tasks and projects. 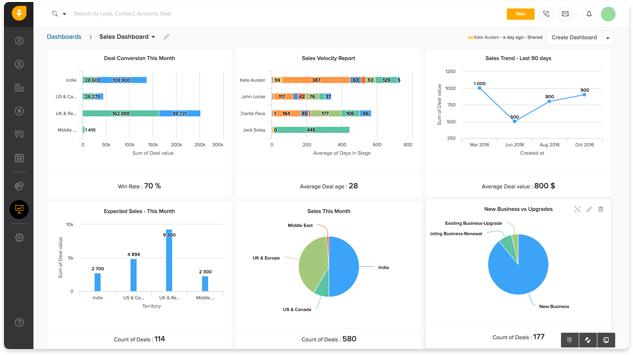 Business Owners and Managers – Data and reporting tools in CRMs help business owners and managers make important decisions based on sales revenue forecasts and the number, stage and value of deals in the pipeline. Salespeople – CRMs help salespeople build relationships at scale by managing and tracking customer and prospect interactions like recent activity, issues resolved by customer service, or promotional offers sent to prospects. Marketers – CRMs can help marketers plan and execute more relevant campaigns based on trends they observe. Customer Service – CRMs benefit customer service by giving the full picture of what the customer has purchased and what their interactions have been with sales and other areas. This information becomes useful when resolving customer disputes or issues. CRMs can benefit nearly all businesses in any industry. The software keeps customer-facing teams organized and able to engage effectively with a high volume of customers and prospects. The data and insights it provides also keeps business owners and managers abreast of trends that impact sales and revenue. The core features of CRMs include lead and prospect management, account and contact management, and opportunity management functionality. These features help sales teams and business owners stay organized and provide easy access to information needed to close deals quickly. Core features of ERPs can include CRM features, but also include accounting and financial management, order management, and reporting and analysis. A core feature of ERPs is a module to manage and house data for financial management and accounting. These features allow users to perform tasks like working with invoices or managing payments and purchase orders. It also allows them to create financial reports to view financial trends over time that are helpful in making business decisions. Another core feature is HR management. This feature helps users perform HR functions ranging from recruitment to managing payroll and benefits. Data from these activities feed into the ERP system, making it easy to use analytic tools to create reports around HR-related factors throughout the company. With data from an ERP system, business managers can identify problem areas like where turnover is high or where vacation time is underutilized. CRMs offer sales teams and business owners a central place to store and manage all their leads. CRM software can integrate leads from advertising and lead generation campaigns as well as leads salespeople get from networking. A good CRM can also categorize leads by source so that salespeople know what methods are working. Read our article on lead management and CRMs for more information. CRM software helps salespeople and business owners keep track of their opportunities and manage their pipelines. CRMs provide a place to document and actively work on upcoming sales opportunities. They also offer a platform that can help sales and business leaders predict sales and determine the amount of effort needed to hit goals and quotas. You can read more about how to set goals for your team using a CRM in our article on How to Set a Sales Quota. There are many ERP and CRM providers. Small businesses have more options when it comes to CRMs versus ERPs. Competition to meet small business demand is still growing in the ERP space. However, there are several providers in each category with options for small businesses. Most ERP software is geared towards larger businesses. However, there’s an increased demand for ERPs in small to medium-sized businesses. There are a number of small business ERP providers, such as Microsoft Dynamics 365, Netsuite, and TradeGecko. What’s more, CRM providers like Apptivo and Freshsales are making ERP features available in their software. Microsoft Dynamics 365 is an ERP that offers CRM features. Some of its features include the ability to manage and get data for finance and operations, retail HR, customer service, and field service. Compared to traditional ERPs, pricing is affordable, starting at $115 per user per month. This software is right for product-oriented small businesses. TradeGecko is an ERP for ecommerce businesses. It offers integrations with ecommerce platforms such as Shopify, Etsy, Amazon, and WooCommerce. It also offers a B2B ecommerce platform along with accounting integrations with Xero and QuickBooks. Compared to enterprise-grade ERPs, TradeGecko is affordable for small businesses, with prices starting at $79 per month for smaller businesses and $799 per month for larger businesses. Today, there are many options for CRM software. 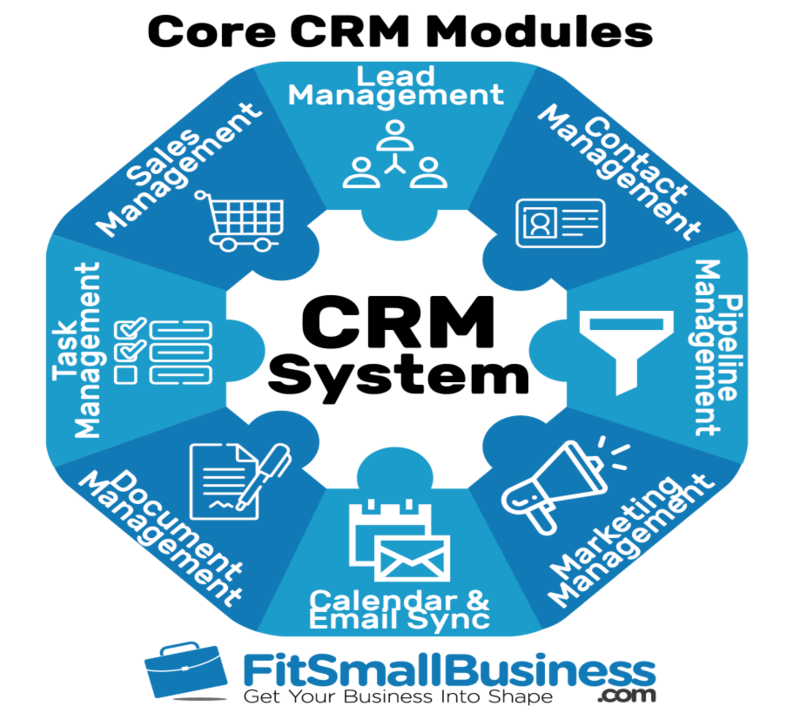 At Fit Small Business, we use Insightly, but there are other CRM software providers offering software specifically designed for the small business market, such as Freshsales, Pipedrive, and Zoho. Each of these products has unique features suited for specific business types or business process needs. Freshsales is right for businesses with territory-based sales teams that rely on inbound and outbound calling. It has a built-in phone system with features that include click-to-call, call recording, phone number assignments, call transfers, and phone activity reports. It also allows you to establish territories and assign leads based on your criteria. Insightly is the best for businesses focused on long-term relationships because of its project management features. It is also great for businesses that need automation and efficiency tools like the business card scanner, email templates, web-to-lead forms, and lead assignment. Pipedrive is a visual, pipeline-focused CRM that helps salespeople with critical tasks throughout the sales cycle. It’s best for salespeople wanting to create visual pipeline stages and define activities within each stage to be complete. Its kanban board pipelines are easy to use and its contact enrichment features reduce manual research. Zoho CRM offers social media engagement and also has a phone integration. It’s great for salespeople who rely on calling and social media to engage customers and prospects, and want to do so within their CRM. 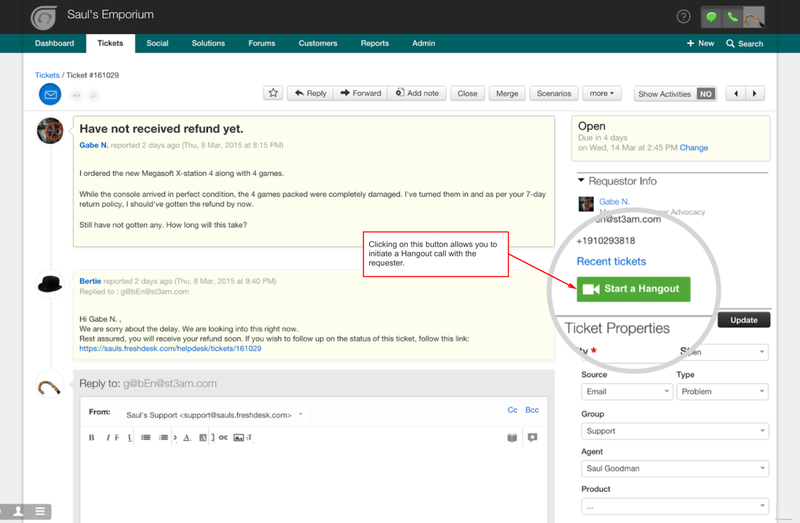 It also supports email campaigns and live chat for additional channels of engagement. However, these are just some of the CRM options available in the market today, each with their own benefits and specific drawbacks. You can learn more about these products as well as other CRM products by visiting our CRM Review page. Most ERPs include a CRM module, though often their out-of-the-box features are limited and may require extensive customization. Conversely, some fully-featured CRMs come with tools to assist in operations, though these are also often much less robust than what can be done with an ERP. Integrations with third-party tools within either software type allow you to build a fully-customized suite of software with only the features your team requires. How to integrate these two options depends on the software selected. For example, some integrations with third-party software might only offer access to data, but for more robust features, you’d have to use the other product’s user interface. However, some software integrations can appear more seamless, giving you full access to a product’s features without having to switch between software. Freshworks, maker of Freshsales, provides access to additional apps you can add to your CRM, giving it ERP features with a couple of clicks. For instance, a QuickBooks integration allows you to add accounting functionality. You can also integrate with Freshdesk, a Freshworks app for customer support. This option is great for companies needing to add one or two ERP features. One Central Location for Data – Both ERPs and CRM software allow businesses to store a large amount of data in one place. ERPs offer a place to store nearly everything that comes from business functions, while CRMs offer the ability to store customer and prospect data. Ability Organize and Filter Information – Because everything is in one central location, both CRMs and ERPs offer the ability to organize and filter large amounts of customer, prospect, and internal and external business operations data. This allows business owners and sales managers to access data they need to build on strategies that benefit the business. Robust Tracking and Reporting – CRM and ERP software give small businesses the tools to track the effectiveness of their activities. The data stored can be turned into insights that can be used to make business decisions. Affordable Options for SMBs – Today, there are a variety of affordable ERP and CRM software options. 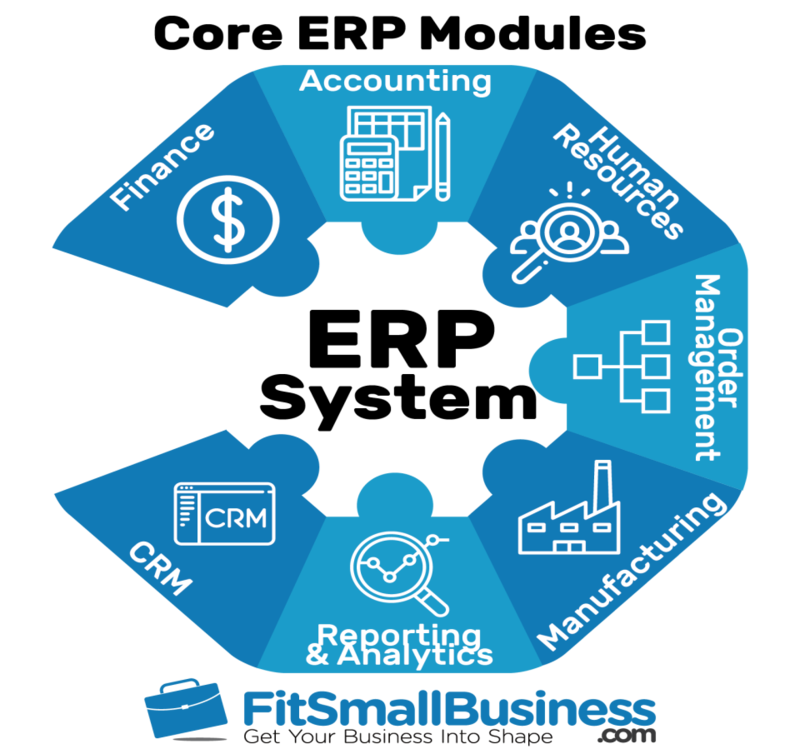 The CRM space offers more options, but it is possible for small businesses to get an ERP or a CRM with ERP features and integrations without having to spend millions of dollars. Cost Prohibitive – Many CRMs and ERPs can be cost prohibitive to small businesses. There are now several affordably-priced options for small businesses, but the key is selecting a CRM or ERP with the features you will actually use, can scale with your business, and is offered at a price point you’re willing to pay. Time-Consuming – CRM and ERP software can be time-consuming for business owners and salespeople to use and time-consuming to set up. Choosing software that saves time is important. Ease of Use – ERPs and CRMs can be difficult for both you and your employees to use. Choosing a solution that easy to use is essential. Resistance to Use or Adoption – All employees, especially salespeople, hate tasks that they perceive as preventing them from selling or performing their job function. If the CRM or ERP software you choose is difficult to use or is time-consuming, your employees will not use it. If this happens, any data in your system won’t give you the information you need to make decisions for your business. What’s the Difference Between an ERP & a CRM? The difference between CRMs and ERPs is that CRMs facilitate relationships that drive sales, while ERPs help drive overall business efficiency and performance with data. A CRM is customer relationship management software that helps businesses manage and optimize relationships with customers and prospects. It is a pipeline tool that establishes sales stages as well as manages and tracks activities within each stage with things like alerts and automated emails. To learn more, see our article on What Is a CRM. Enterprise Resource Planning (ERP) software aggregates data from internal and external stakeholders so that business owners can manage and plan resources like staffing and materials. The purpose of an ERP is to use the data to increase efficiency and drive performance. To learn more about ERP systems, read our ERP software reviews. The difference between CRMs and ERPs is CRMs focus on fostering customer and prospect relationships while ERPs help drive overall business efficiency and performance. Whether you need a CRM, an ERP, or both really depends on your business. Starting out with a small business-centric and general-use CRM is often the best first step, as these are typically designed to help you grow your business by focusing first and foremost on the needs of the customer. A CRM like Freshsales is a great option as it offers a forever free plan as well as a marketplace of affordable apps that can help make its features even more powerful as you grow. Start using Freshsales for free by visiting their website.